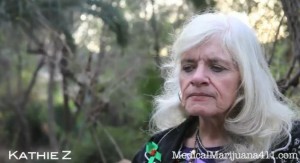 In this video shot at Willow Creek Springs, medical marijuana patient and retired nurse Kathie Zamanjahromi, Kathie Z for short, remembers how some of the children she cared for when she was a nurse could've benefited from cannabinoid therapeutics. A medical marijuana patient herself, Kathie explains how medical cannabis helps her maintain a quality of life she hasn't experienced in a very long time and attributes her improvements to her daily dose of medical cannabis. I'm, Kathy Zamageromie, they call me Kathy Z for short. I am a retired pediatric oncology hemoc nurse. I also took care of many other children. I'm now able too meet some of these people that I have cared for in the medical marijuana community and to be able to help them use this medicine to improve their quality of life today. And some of the things this medicine is helping are things are things the medicine that I gave at that time was a side effect of it. Like the spasticity, or the different side effects of the AIDS medication, or the cancer treatments. Now I can look back and say this medicine would have been so helpful all those years for the children. The government has these laws that are completely foreign, that are not even based on truth. How can we enforce a law that is built on falsehood? I originally used medical cannabis by smoking it. With the osteoarthritis I have, and the different ruptured disks, and other painful conditions that I have, the smoke completely take away the pain, but it would help some. But I was still taking large doses of Norco, and that ended up I was on anti-depressants and sleeping pills. It wasn't until I got started eating edibles that I realized I could maintain my level most of the time. But what I found with edibles, was that I had to consume too much during a days period, and I couldn't eat that much. So then the next step for me came with the tincture. And that has been able, because it is a concentrated form I use the tincture in glycerin because alcohol bothers my system, I can use that under my tongue or I can use it in food. Or some times it can even be used to cook. I sometimes use the vaporizer as well, and sometimes Rick Simpsons Hemp Oil. And I use a balancing between the different medications so that I can keep as pain free as I can. I've been able with a combination of medications; I have been able cut down on the use of Tylenol with Codeine. During the summer, I had a three-week period that I took none and it was wonderful. This winter I have had more trouble with this left hip, and I have had to start taking some of the Tylenol with Codeine again. I haven't been having to take more than about 2 a day, which is so much different than when this hip gave me trouble 10 years ago. I took on an average day 4 to 6 Norco's and even with the edibles I still had to take two. So the fact now that I could go for a three-week period and take none is remarkable. My mobility is up. I'm down 200 pounds from 2003. The last 50 pounds have come off in the last year. I find that when I keep my cannabis level up, I don't crave carbohydrates like I used to. I found that I am eating more fruits and vegetables, and I am so much healthier than I was 7 years ago. They had told me in 2003 that I had about 6 months to live, my son was 13, and I knew I needed to get better. So now I have my life back. I'm glad to see your doing ok. I'm chomping at the bit want to start growing my own medicine plants. I also like to just smoke it for stress relief. I was much younger when I smoked it, but in either way I look at it I was much healthier during the period of time that I smoked. I smoked cigarettes so long that having given them up, I fear that not partaking of my medicinal smoke might open me up to possibilities of attacks of cancer. I am type 2 diabetic, I have COPD, Cronic Bronchitis, I am on Oxygen therapy of 6 liters a min. I am around 240 lbs overweight. Please provide locations where I can obtain Rick Simpson oil in Vancouver, British Columbia, Canada. Thank you.